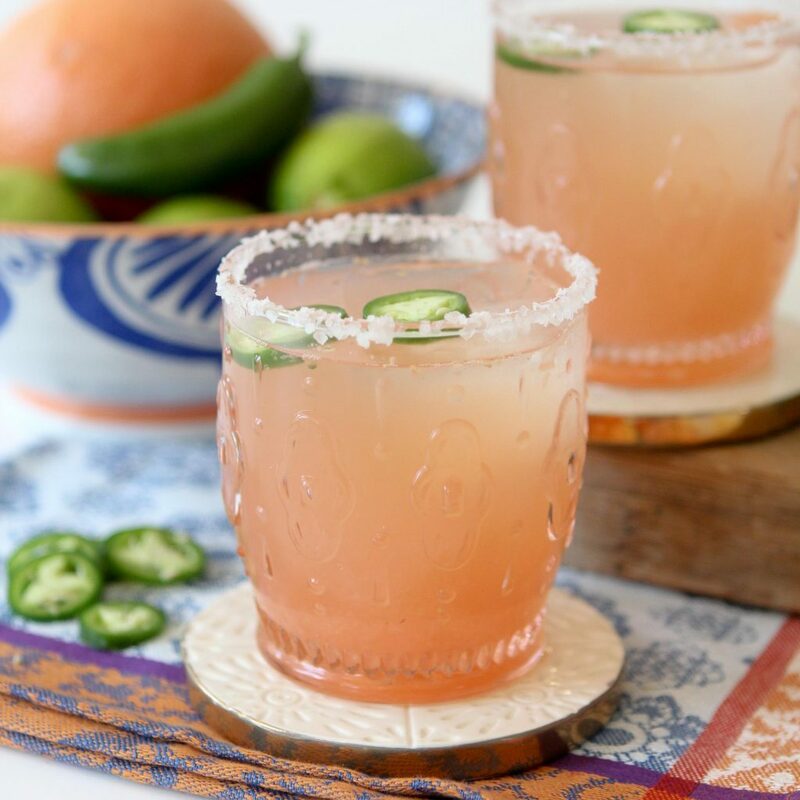 This cleaned up paleo(ish) Spicy Honey + Grapefruit Margarita from The Whole Smiths is just what the weekend is calling for. But I’m not one to judge so maybe your Monday morning is calling for it too? With summer winding down, we’re trying to cram in as many refreshing drinks as we can until the colder months hit. That’s totally normal, right? Don’t get me wrong, I love me some cozy winter drinks but I know that in a few short months I’m going to be longing for the days of sunshine and a cold, bright cocktail! I love fresh, summery and not-too-sweet drinks in the warm weather and this margarita really hits the spot. Let’s talk about cocktails and drinking and how that can still fit into a healthy diet and lifestyle. Well, first off moderation but I’m not here to yap about that, let’s talk about what’s actually IN our drinks. I approach a cocktail in the same way that I approach a meal or the food I eat; I like it to be minimally processed, using whole, fresh ingredients and low on the sugar. And you know what? It tastes better that way too. While I don’t have drinks every day or even every week at this point, I do enjoy cocktails in my Food Freedom when it’s worth it. When I’m with friends or family celebrating is when it’s most worth it. It’s no different than a dessert in my book. I know I’m not going to feel great if I consume them too often and I go with that. If you want to check out some of the other cleaned up cocktails I’ve made, check out my Blackberry Bramble or my Dairy-Free White Russian. Every time I make this at a BBQ, our friends love it. Even the ones that think they may not like the heat turn into fans. I have to confess, one of my favorite drinks is a Salty Dog. Basically it’s grapefruit juice, vodka and a salty rim, so it’s no surprise that I love this as much as I do. I also recommend pairing it up with my Baja Shrimp Tacos. 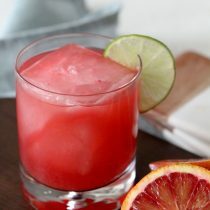 A spicy twist on a an old favorite.. grapefruit margarita! Combine honey, water and cayenne pepper in a saucepan and bring to simmer. Cool in fridge. In a shaker add grapefruit juice, honey, cayenne syrup, Cointreau, jalepñeo slices & ice. Strain over ice and garnish with a lime or jalepeño slice. This is a terrific and fresh alternative to the now-commonlplace bottled margarita mixes. While this recipe is delicious in its own right, it’s missing that tangy zing that only a lime can deliver. 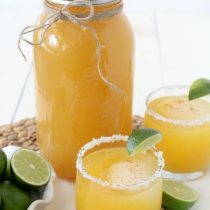 Try adding the juice from half a lime for each serving and this recipe achieves margarita perfection! P.S. The jalepano garnish is such a fun idea! I think the instructions are leaving out the tequila? ?